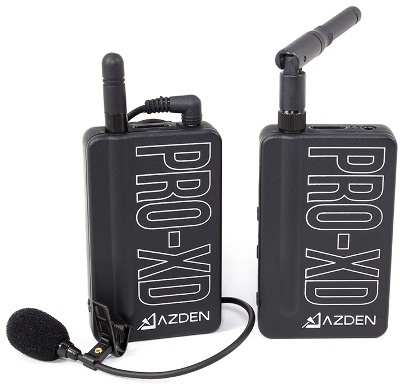 The Azden i-Coustics PRO-XD is an easy to use and affordable digital wireless lavalier microphone system for camera mounting and mobile video applications. Its compact and lightweight design is a great solution for capturing audio on the go. Perfect for video production, electronic news gathering and even mobile devices, the PRO-XD includes an adapter cable for compatibility with headset inputs on most modern smartphones and tablets! Designed to deliver high-fidelity audio, the receivers high gain output with volume control alleviates noise and hiss produced by low-quality camera preamps and eliminates the need for big adjustments in post-production. The PRO-XDs transmitter uniquely includes an auxiliary line input, allowing you to wirelessly transmit any stereo, line level audio source and mix it with the microphone source if desired.